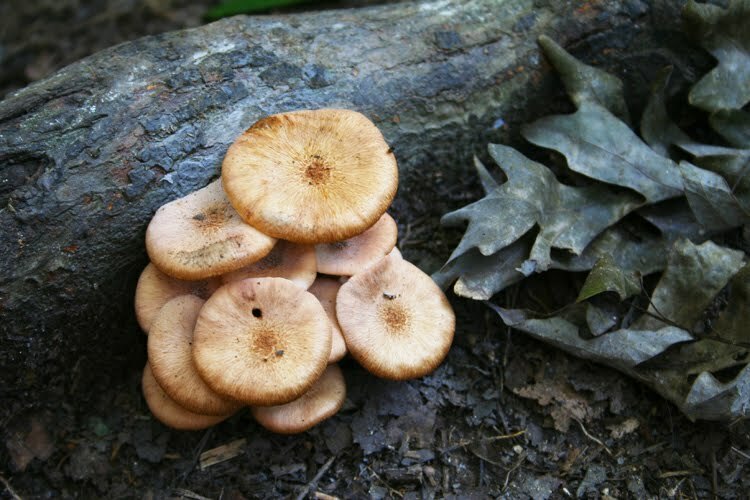 The woods in August are such a thing to behold, so very different from the spring and early summer woods. Here, especially with the rain we've gotten this summer, the trees and undergrowth are lush and dark green and provide nice shade for walking on a hot late summer day. 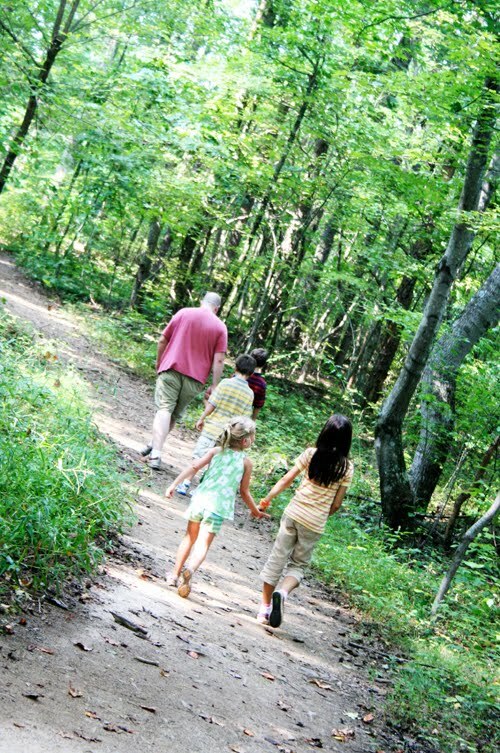 We were fortunate to take a short hike with our friends before they had to head back out of town. I can't think of many things sweeter than seeing my childhood best friend's daughter holding hands with my own daughter walking through the shady, green woods. 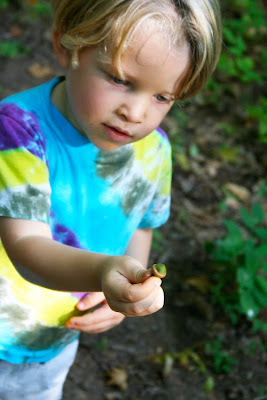 The season's first fallen acorn appeared while on our walk, and Finn was thrilled to collect it for our nature table. 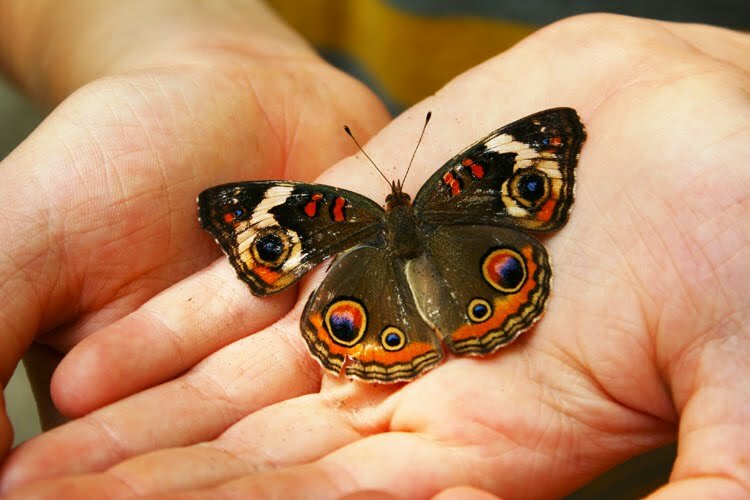 Philip found a less-than-healthy butterfly and cradled it ever so gently for a while before carefully placing it on a log out of harm's way. 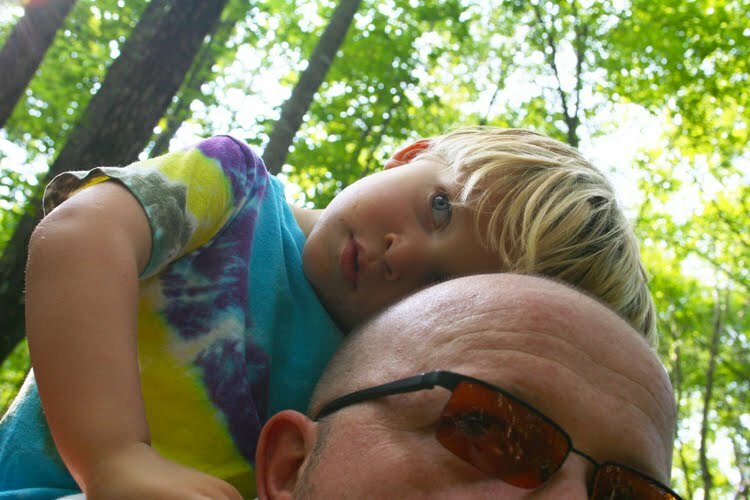 He's our gentle soul, that Philip. 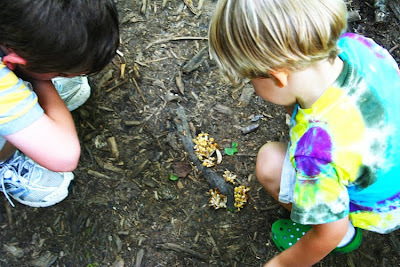 And the forest mushrooms...they were everywhere! 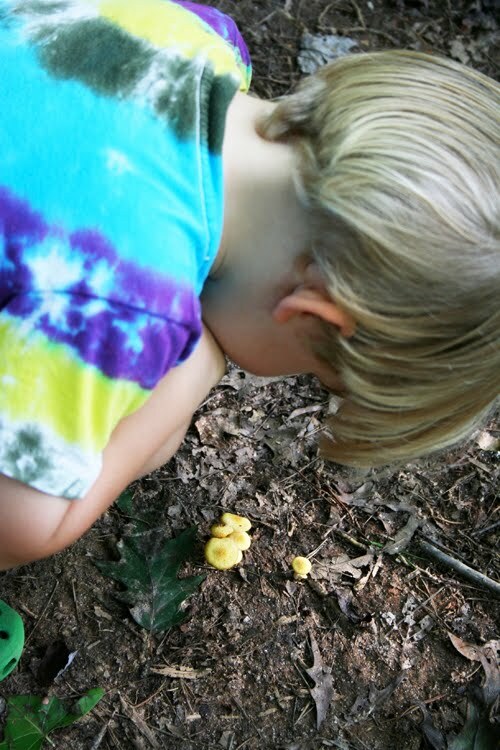 I don't think Finn had every noticed a mushroom before this hike through the woods, or maybe he just didn't have the interest before this walk. With great intensity, he examined every clump we stumbled upon. He even found some teeny, tiny ones, as evidenced by how huge his finger looks in this photo. If anyone knows a simplified book on mushrooms for the preschool or early elementary aged set, I'd love a recommendation. 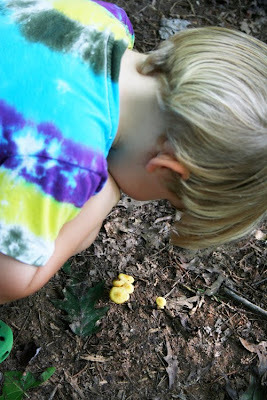 I think my kids would be fascinated to be able to identify some of the forest fungus we keep finding. In addition to the tiny mushrooms, we found some saucer-sized, flower-like fungus growing on this log. So many beautiful treats for the eyes on this walk! 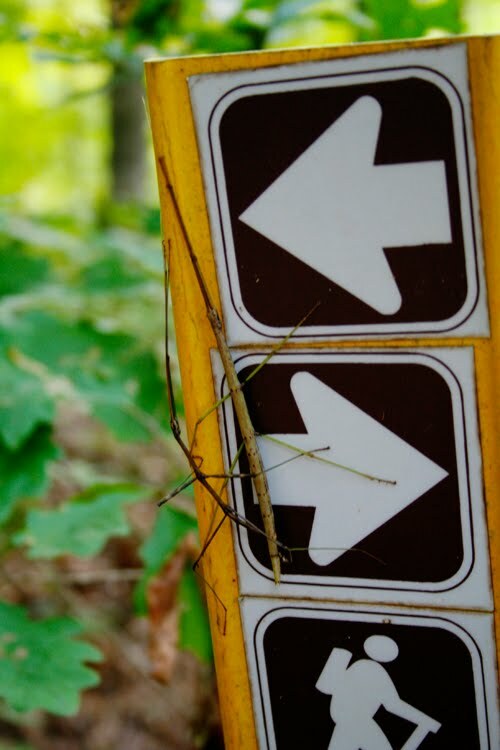 Paulie, with his razor-sharp observation, noticed a couple of stick bugs on one of the hiking signs. Aren't they amazing?! 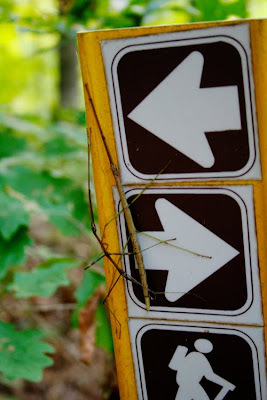 They really look like little twigs attached to the sign. They didn't even move or twitch with poking and prodding, just like the little twigs they pretend to be. Soon, the littles became tuckered out so we headed out of the woods. Hopefully, we get a chance for another hike or two in these deep green woods before the leaves begin their autumnal changing. Beauty appreciated with loved ones-friend and family and nature. Your blog ranks in my top ten; thanks. How fabulous! 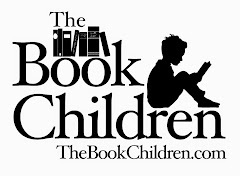 If you find that mushroom book, let me know. We so love our time with you guys. Thanks so much. Fantastic finds! 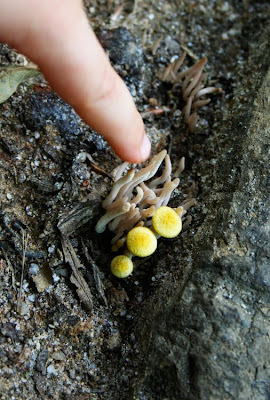 I love the tiny mushrooms! So funny that I posted the same thing at my blog. Thanks for sharing. 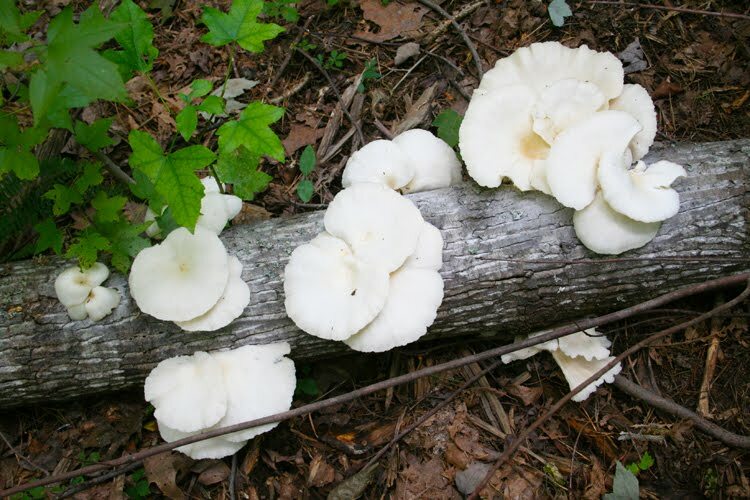 I love seeing all the mushrooms in the woods right now, but do you know what? We had a mushroom growing through through the crack between one of our bathtubs and the cedar wall next to it, inside the house! That can't be good. We've been talking about gutting that bathroom for years, and now I am really motivated!